Those who possessed the 1951 edition of the Pelican 'British Music of Our Time', edited by A. L. Bacharach, will remember that one of its most valuable sections was the 27-page discography at the end, all of course, of 78 rpm recordings. Although Granville Bantock did not receive a chapter to himself in the main body of the book (he was grouped with 15 others in a 'Mixed Gallery'), in the discography, after Delius and Vaughan Williams, he occupied more space - over three pages - than any other composer. 30 works of his were listed (the 1946 first edition listed only one Bantock recording that did not survive the revision) and all these, except three, were recordings from the Paxton catalogue. The proprietors of this music publishing company were the Neil brothers. Cyril Neil was a friend of Bantock's and one of his company's more enterprising offshoots was gramophone recordings, chiefly of light music. Its catalogue not only served Bantock well but, to a lesser degree, also his fellow composer, Josef Holbrooke, (with Bantock himself conducting one item not represented here, a very truncated Birds of Rhiannon). The Processional from King Solomon has almost a whiff of Crown of India about it. For all its grandeur it is a slight anti-climax as one half-expects a big tune or trio to come - in vain. But there are other surprises in store. This commercial Paxton recording is here followed by some rare archive material: a piece of narration (from 2 Chronicles Chapter 1), delivered by Harman Grisewood, and the stately choral hymn Praise Ye the Lord, both taken from the Coronation broadcast on 6 May 1937, with Bantock this time conducting the London Select Choir and the BBC Symphony Orchestra. But the gem of this disc is the first item: The Shulamite's Monologue, that comprises 'The Second Day' of The Song of Songs (the whole work spans five days). Some publicity described The Song of Songs as an opera in five acts, but in the vocal score there is no use of that terrn, although the list of characters and the brief synopsis hint at its operatic potential. Listening to this twenty minute scena, one feels, in many places, a dramatic urgency similar to 'The Sun goeth down' in Elgar's The Kingdom. The five parts of The Song of Songs were published between 1922 and 1927, the year in which the work had its first complete performance under Hamilton Harty at a Hallé concert. This performance of the Monologue is taken from a 1936 broadcast, with Bantock again conducting the BBC Symphony Orchestra. For what should strictly be a dialogue between the soprano Shulamite and her tenor Shepherd lover, here the two vocal lines are taken by the soprano, the Liverpool-born Laelia Finneberg, who made her first London appearance in 1933 and she is heard here in glorious voice. The sound quality is remarkably good (with only just a very slight hint of 'wow' at the end), the surface noise by and large negligible, and the side-joins inaudible. One is literally swept along by a performance of great passion, full of energy, drive and sensitivity, with marvellously controlled rubato. Of the other items on this CD, the Russian Scenes can be heard in full in the Marco Polo Bantock CD 8.223274 (with the Hebridean Symphony and the Old English Suite), but the live1y Polka alone is here performed in a 1937 broadcast by the BBC Welsh Orchestra conducted by the composer and conductor Mansel Thomas, later to become Head of Music, BBC Wales. There are two HMV acoustic orchestral songs: Invocation to the Nile and Lament of Isis, sung by soprano Leila Megane (with whom Elgar had recorded his Sea Pictures nearly a year earlier). These are followed by another discovery: the song with orchestra, Now, with Frank Mullings, and Bantock conducting the BBC Symphony Orchestra in a broadcast on 14 September 1936. The Pilgrim's Progress was a commission in 1928 for the Bunyan tercentenary, first performed in November that year in Queen's Hall by BBC forces conducted by the composer. The BBC National Chorus, that was first heard in that performance, recorded for Columbia, the following January, two sections with the BBC Wireless Symphony Orchestra under Stanford Robinson. The chorale 'The pilgrim now hath found his Lord' precedes Pilgrim's entry into the Valley of the Shadow of Death. (A cut of three pages in the vocal score is made, necessary no doubt because the 78 side runs for over four minutes as it is.) This is followed by the more demanding and more complex chorus 'In Praise of Famous Men' that comes near the end of the work. This is performed complete, apart from a slightly abbreviated orchestral ending. The chorus of 250 voices stretched Columbia's recording capacity to its limits without any serious distortion. Next, the King's address to the Shulamite, 'Behold, thou art fair, my love' from the Third Day of The Song of Songs is heard in a 1937 recording with bass-baritone Oscar Natzke accompanied on the piano by Hubert Greenslades. The CD ends with another archive rarity, what is probably the only recording in existence of Bantock's voice, the introduction from a radio broadcast in 11th March 1941 when he presented a selection of gramophone recordings of Sibelius's music. For content and engineering skill, this CD must surely be a front-runner for the Historical disc of the year. Perhaps the first performance of the Five Ghazals of Hafiz, in the 1937 broadcast with Harold Williams and the BBC Orchestra under Clarence Raybould, might be considered for a follow-up CD, together with more Paxtons. A word of praise for the booklet (which contains full texts) and the CD casing design. One feels one is handling something of quality. Most exciting. This a disc of discs. This is a highly welcome and long overdue addition to Bantock's current discography, and for all admirers of the composer's work a major evident in this year's musical calendar. Song of Songs and Other Historical Recordings is a varied collection of historic recordings put together by Lewis Foreman mainly from BBC broadcasts and 78s. The CD is most pleasantly packaged and adorned with one of Helen Bantock's designs. It runs for almost 77 minutes, and, re-mastered by Michael Dutton, the sound is astonishingly good and potential buyers should not be put off by the age of the performances. Apart from the short Polka from Russian Scenes all the included selections are new to the CD catalogue. The opening and longest item in the programme is an arrangement just for soprano (the section covering tracks 2 and 3 was originally a tenor part, the Shepherd) of the Second Day of GB's mighty Song of Songs. The performance was broadcast on 30th March 1936 with GB conducting Laelia Finneberg and the BBC SO, but the composer's own private recording is used here. Although GB was an avowed pagan (and liked to shock and to flout the conventions of his day), he was still often inspired by Christian literature and notably by the poetical elements of the Bible, and this 'opera' or 'staged oratorio', set for six solo voices, chorus, and orchestra, comprises settings from two books of the King James version (which the composer loved and admired): namely, the entire eight chapters of The Song of Solomon, and six Psalms used for four choral interludes and the mighty choral procession. The programme notes from a Belfast Philharmonic Society performance in 1928 mention that GB may have got the idea for his literary format from a book by Ernest Renan (1823-1892), the French orientalist and writer on religion. GB eschews all allegorical interpretations of Solomon, and the lyrical love verses and the psalms are framed into a triangular love story depicting King Solomon's infatuation with a Shulamite Maiden whose constancy for her shepherd lover eventually triumphs over the unwanted desires of her royal suitor. GB rarely did things by halves or even seven-eights and this colossal creation in its entirety would obviously try the patience of most modern audiences (it would probably run near to three hours in the hands of some of today's conductors): but this is not really an example of GB's more wayward and indigestible compositional intemperance which is so evident in some parts of his oeuvre especially in his early days. Song of Songs is in fact a work of sustained musical quality and of abiding grandeur, and if it is thought by some that it does not quite match the magnificence of Omar or Sappho, then to my mind it is there or at least thereabouts. The 'second day' may not necessarily be the most commanding Act of the work, but the graphic impact of GB's astonishing gift for sublime and intense emotional communication and of his characteristic opulent harmonies and luxurious sonorities remain for all to hear. Finneberg's quite exceptional performance as the Shulamite comes across wonderfully well and is a real bonus. Much less appealing is a section (the first part of chapter IV of The Song of Solomon) from the morning of 'Day Three' arranged as a recital piece with piano accompaniment. It was one of a couple of separately published issues from the work and was recorded the following year with bass baritone, Oscar Natzke. To reduce it thus was not one of GB's better artistic decisions as the rhapsodic rapture of the piece is almost completely lost in this skeletal frame. It is left somehow merely ramblingly fascinating rather than an abidingly enjoyable musical experience. Nonetheless, it does reveal the sheer relentless invention of GB's muse and there are moments of enterprising pianism. King Solomon is another very attractive inclusion in the programme and this too is certainly amongst the wheat of GB's harvesting. It is a much smaller musical conception than Song of Songs and was written for King George VI''s Coronation in May 1937. It is constructed in three parts. The first, Processional, opens with a mighty fanfare and is followed by an extended orchestral march which reminds me of Respighi. There was a break in the original transmission so this portion of the work is taken from GB's recording with the London Promenade Orchestra released on the Paxton label in 1945. After a narrated middle section (obviously using the words of a more recent modern biblical translation, I think of part of chapter III of the first Book of Kings), further brass introduce a choral setting of verses adapted from Psalm 148, once again the King James version. Both these are taken from the Coronation broadcast. This is GB in more straightforward style with simple, broad and sweeping harmonies, but King Solomon is still a most engaging creation, full of vibrant colours, and retains its potent force even outside its original setting. If Song of Songs and King Solomon are two examples of GB's extraordinary vocal craft, then Pilgrim's Progress has been considered the composer in not such inspired form. It was commissioned for the 300th anniversary of Bunyan's birth, and the work was not well received in some critical quarters at the time. One wonders why listening to the two examples presented here from Stanford Robinson's 1929 recording for Columbia with the National Chorus and the BBC Wireless Symphony Orchestra. It is another lengthy work, but is more in the direct musical spirit of King Solomon than the vast, complex musical architectonics of Song of Songs. The chorale, The Pilgrim Now Hath Found His Lord, begins with two a cappella verses of Bowker Andrews's provided poetry, with particularly striking antiphonal effect in the second, before the chorus proceeds into the final stanza with a mighty orchestral accompaniment. In Praise Of Famous Men is the closing episode of section 11, Through the Golden Gate, the penultimate movement (GB closes the work with a short orchestral epilogue): it is writ large with a big 'B' and constitutes the grand choral climax of the work. Though the words seem somewhat incongruous for such a moment in the proceedings, the music is powerfully uplifting and produces a splendour that should beguile many. The two brilliant excerpts from Pilgrim's Progress are followed by a recording of Frank Mullings singing GB's setting of Browning's Now (from the Dramatic Lyrics) with the composer conducting the BBC SO. Browning was one of the composer's most cherished poets and GB composed over fifty settings of his poetry. Mullings had been singing this and other Bantock material for years and was something of a Bantock specialist and it is interesting to hear his voice at last after having seen his name so often in programmes of GB's music. He certainly gives it some welly and the piece provides him with an ample opportunity to extend himself, but at times his phrasing is a little too affected and he perhaps makes it all just a little too emotionally wrought. The oldest recording in the collection is from 1923. It is also the earliest example of GB's work on display. The Invocation to the Nile and Lament of Isis, both begun in late 1896, constitute the first and fifth of the six Songs of Egypt which were the third in the series of the six sets of Songs of the East, GB's first collaboration with Helen Schweitzer who was soon to be his wife. We are provided with the orchestrated versions sung by Leila Megane and released by HMV in 1923. There is certainly a pleasant whiff (for this is not necessarily a bad thing!) of the musical hall in Invocation, but some of the orchestral ornamentation sounds a bit naff. Isis is much more impressive and really hits the mark: the wonderfully grieving melody line, dare I say, even summons up some of the pathos of Sappho's yearning (I've just noticed Anderton, GB's first biographer, also makes the correlation - so there you are, it is not as curious a comparison as it may at first seem to be), though once again the orchestration days not quite match it. Taken for what they are, they are pleasant and pleasing and certainly Lament of Isis is one of the most worthy songs in the whole series and is well warranted a recording - it is interesting to note that at the time in a letter to Helen GB considered his first few Songs of the East to be his finest achievement thus far, even if his burgeoning romance with his collaborator may have slightly clouded his judgement somewhat. GB wrote many great works involving the human voice and made a supreme contribution to the songs and vocal repertoire of his nation - even aside from the more patent examples such as Omar, Sappho, Five Ghazals of Hafiz, Ferishtah's Fancies, The Great God Pan, and others - and there is sadly still so much that needs to be recovered from undue oblivion and newly explored. It is a joy therefore to get even this brief glimpse of GB's vocal virtuosity, however much it remains wonderfully out of synch with present day musical tastes. But if GB was understandably primarily admired and lauded in his day for his choral works and songs, his musical genius was also equally revealed in the mastership of his orchestral invention and indeed many of his purely orchestral works sound much less dated than his vocal scores and are clearly more in accord with contemporary sensibilities - his symphonies, for example, should be a staple diet of the orchestral repertoire of his country. Vaughan Williams (he and GB seem to have never clicked as personalities) once remarked that 'what Bantock did not know about the orchestra is not worth knowing', and it is a debatable point that, due in part to the abiding musical priorities of his time, GB was too often overly taken up with vocal and choral composition to the detriment of his orchestral creation. The examples presented here range from mere divertissement to the genuinely inspired. Circus Life Overture (an orchestral recasting of the Overture of a set of piano pieces entitled A Marionette Show) and The Glory of the Sun (also originally a piano piece) are from GB's late association with Cyril Neil and the Paxton record label. Performed by Walter Collins and the London Promenade Orchestra, they are short, light, playful, throwaway pieces and have some delightful moments and are either to be enjoyed for what they are or disliked for what they are not according to the tempers of your musical opiniatry. Still, they could perhaps have been left for another time or at least been more appropriately sequenced: they come immediately after the emotional intensity of the Song of Songs and therefore require here a radical re-adjustment of musical focus which could tend to diminish their impact even further - but then again they do act as an engaging respite. The Macbeth Overture, also a Paxton recording but this time with Dolf van der Linden and the Metropole SO, is a little more serious and substantial and a far from inferior piece and has some highly enjoyable passages: it is GB in fine, fair-to-middling form and an occasional outing in the concert hall would do no-one any harm. However, Four Chinese Landscapes, another Collins/London Promenade Orchestra/Paxton recording, is one of the real highlights of the whole collection and worth the admission fee by itself. It is a superb and potentially very popular work and such a pleasing orchestral conception that it surely requires the Handley/Hyperion treatment in the not-too-distant future. The piece which follows, the Polka from GB's much earlier Tchaikovsky-like suite, Russian Scenes, is a cheery and sprightly miniature (the full work can be found on a Marco Polo release alongside his even more entertaining English Suite and one of GB's bona fide masterworks, the Hebridean Symphony, and the CD also comes highly recommended). The collection closes first with GB's introductory statement to a recital of Sibelius's music: it is the only known recording of his characterful voice. This was an excellent idea and the programme should possibly have fittingly ended there, but for some reason (though perhaps I am being unduly humourless here) this is followed by the radio announcement concerning the gap in the BBC broadcast of King Solomon (you rarely hear voices like that any more on Radio 3, thankfully!). This is a wonderful assortment of the ranged nature and qualities of GB's vast output and for those already taken with the composer's music it is an exceptional pleasure. With each listen it further ingratiates itself on the listener and again one begins to wonder how did this man fall so out of favour. There is no apparent systematic rationale to the choice of recordings and the running order is arguably a little curious. Though the two Solomon works obviously go well together, it might possibly have been more pleasing to have had the intended series organised along more thematic lines (say, Bantock conducting his own works, Hebridean works, BBC radio recordings, Paxton Mood Music, or some such) - though, swings and roundabouts, the very assorted nature of the collection is also part of its very delight and it still works extremely well and many listeners will no doubt much prefer this more mixed approach. Given the material available some of the selections, particularly for an opening and 'catch 'em while you can' volume, might be considered a tad questionable and it includes a couple of items which will obviously do nothing to add to his reputation and are more of curiosity value and of interest mainly to his admirers than examples of his real stature as a composer. Walter Collins's London Promenade Orchestra recording of the Celtic Symphony should surely have been an obvious choice for a Volume 1. But once again it does give a fulsome insight into the variegated quality of GB's scores, including a taste of what some - especially those who like to judge rather than enjoy - will inevitably consider the chaff. One of the essential problems with GB is that he composed his music with an unrestrained and often highly indiscriminate facility (in stark contrast to his friend Sibelius who, if I recall correctly, said he throw away more than he published - a complete anathema to a composer like GB). He could hit and miss in equally extreme measure (sometimes in the same piece! ), some of his loftiness could at times almost cross the border into veritable kitsch, and more could too often be much less: all this has tended to obfuscate the substantial portion of his oeuvre which at its best rivalled the greatest British composers of this century. At the same time, GB was a man of diverse moods and different compositional priorities and many of us bitten with the Bantock bug can take (and often still happily enjoy) the more insubstantial and near gaudy elements of his creative tempers without it diminishing from the unquestionable greatness of his finest scores; and in any case many of his so-called lesser works are not as dreadful as they are too often and too easily assumed to be. This CD gives us a marvellous taste of both and he still comes up shinning like a lighthouse beacon - if there were any of them left. So although Song of Songs and Other Historical Recordings may not necessarily gain any new converts to this great and truly unreasonably neglected composer, it is certainly an essential and prized release for all Bantockians. The nostalgic atmosphere of the whole experience transports us back to musical tastes of a bygone age - a world of family Ovalteenies by the wireless and plummy voiced BBC announcers, and a Labour Party still unashamed of the word 'socialism': but now played nice 'n' loud through your modern Hi Fi equipment this CD helps breath a whole new life into the works, and approached with the appropriate empathy it packs an undeniable musical punch if you are ready and willing to take it. Lewis Foreman's sleeve notes as per usual provide a highly useful background to the recordings - though he repeats the false, but oft-repeated, assertion that GB conducted Sibelius at New Brighton, and GB did not complete and publish Songs of the East 'in little over a year', and (without wishing to sound unduly pedantic) the tale that GB was the first British academic to wear corduroys to a faculty meeting is (I think) a slightly exaggerated encyclopaedic version of the story related by Anderton in an article which relates that he was merely the first to be so attired ('a suit of brown-ribbed velveteen') at a meeting of the Senate of Birmingham University. All in all a wonderful contribution to Bantock's current revival and a hearty thanks and drinks all round due to those involved. Bantock lovers can only look forward to the further promised volumes. To Bantockian time-travellers this is an irresistible issue. Not only are many fabled 78s reissued but private records made from radio broadcasts of the 1930s are also made available. Those who have fallen under the spell of Bantock's late romantic Sappho Fragments (an hour long cycle for soprano and orchestra, wondrously recorded on Hyperion) will want this disc for the hefty fragment from his The Song of Songs (for solo voices, chorus and orchestra). The two works are cut from the same golden sable cloth. Laelia Finneberg is a resplendently secure soprano floating miraculously sustained Straussian high notes ppp at 0.51 and 03.02 in track 3. Bantock was a master of opulent orchestration as this score declares time after time. This is from a radio broadcast. One is pitifully grateful for this substantial fragment but what about the rest of this 2½ hour work which is a hefty partner to his 3 hour Omar Khayyam (for the same forces as Song of Songs) a work crying out for recording. The dark-hued voice of Oscar Natzke guides us through the King's Monologue from Act III but without orchestra it lacks impact despite Hubert Greenslades' valiant pianistic efforts. The Glory of the Sun gallops like a Valkyrie's chariot - a British version of Saint-Saens' Phaeton. The more extended and dramatic Macbeth overture is a Tchaikovskian portrait capturing spirit rather than incident and at 6.30 recalling Bantock's own Hebridean Symphony. Circus Life is bright and effervescent - a Donna Diana of the British overture genre - with a slap and a dash of Waldteufel and Nutcracker. The Four Chinese Landscapes have been a favourite of mine since Mark Bernier sent me a tape back in the early 1980s. It is not the light pier-end frivolity you might have suspected but rather a series of pastel character pictures much accented by Bantock's Sibelian tendencies. Remember that Bantock was the dedicatee of the Finn's Third Symphony! The second piece is clearly recalling Tapiola or Tempest-Storm almost to a tee. The homage is pretty direct. Thankfully there is no tinpot Orientalism. In the finale we meet cross-currents from Rimsky, Richard Strauss and Karelia. The Kouchka are paid jerky tribute in the Polka from the overall rather lack-lustre Russian Scenes. King Solomon is stirring both chorally and in the inky brass fanfares. The processional elements are sturdy and a shade four-square but undoubtedly affirmative. Continuing with GB's beloved 'exotics' Dutton have assembled three songs from his sequence Songs of Egypt. The first two sung by Leila Megane (a Bantock 'favoured one') recollect the Sappho Songs. The last one is taken by Mullings, another GB stalwart. Then a switch from exotica to mainstream British C of E. Pilgrim's Progress, sounds rather like splendid hymnal arrangements at one moment and at another like a Delian Mass of Life manqué. Regrets: a few. What a pity that the 1930s broadcast of Harold Williams singing the Five Ghazals of Hafiz (baritone and orchestra) could not have been included. The disc is discreetly marked 'vol.1' so perhaps there are hopes for vol.2? Also long anticipated is the 1925 Boult acoustic set of the Hebridean Symphony. There are also stacks more of those Paxton and Cyril Neil mood music bonne-bouche 78s to act as fillers. The disc is rounded out by the voice of Bantock speaking about his idol, Sibelius. This generous disc deserves to do well and I recommend it to Bantock fanciers and anyone caught up by the diversity and inventiveness of British music in the 1910s and 1920s. Bantock had little time for nobilmente or pastoralism or jazz. Instead his very evident models were Tchaikovsky, Strauss, Sibelius and the Gaelic hegemony. More strength to Dutton and the Bantock Society. This anthology is labelled Bantock Society Historical Recordings Vol. 1 and contains music from The Song of Songs - indeed, by far the longest selection on the disc is the first track, the 20-minute "Shulamite's Monologue" from Act II, the BBC SO conducted by the composer in 1936 for the BBC National Programme - as well as from King Solomon, Songs of Egypt, Pilgrim's Progress, the Macbeth Overture, Four Chinese Landscapes and a few other short pieces. There is also 1:38 of Bantock talking about Sibelius. Michael J. Dutton's remasterings are always done with both respect for the source material and considerable technical accomplishment. There are no gimmicks, simply as good a transfer as possible given the technical limitations of the original recordings and the deterioration over the intervening years. Technically the music sounds as good as can be expected, and despite the inevitable distortion on some orchestral peaks, sometimes a great deal better; the clarity and richness of soprano Laelia Finneberg in the "Shulamite's Monologue" is a revelation. 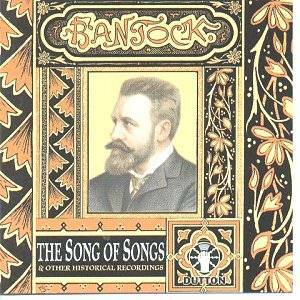 The music itself makes a strong case for the critical reappraisal of Bantock as a significant British composer, and the performances, many of which are conducted by Bantock reveal a subtly and sense of atmosphere not usually associated with his name. The booklet is well illustrated, contains full texts, an 8 page essay by Lewis Foreman and some fascinating background on the recordings themselves. For the Bantock aficionado this release is essential, and may well go some way to bringing this undervalued British composer back into the public eye. A most commendable issue. The tale behind the resurrection of this fabulous compendium is admirably told by Lewis Foreman in his extensive notes to the disc. I won't intrude on that side of the coin! This is indeed a fantastic collection of private pressings and recordings finally seeing the light of day as commercial recordings over fifty years after. The miraculously vivid sound is another tribute to Mike Dutton who has been definitively re-creating the sounds of yesteryear with the best possible results. We have two extremely rare overtures, 'Macbeth' and 'Circus Life', which receive vivid recordings by the Metropole Symphony Orchestra conducted by Dolf van der Linden and the London Promenade Orchestra under Walter Collins respectively. The main work is undoubtedly Laelia Finneberg's glorious rendition of 'The Shulamite's Monologue' from The Song of Songs conducted with understanding by the composer in an uncannily vivid 1938 recording. 'King Solomon' is also well represented with a stunning 'Processional' and 'Praise Ye Lord' both conducted by the composer. Frank Mullings' inimitable voice is heard on a 1936 recording of 'Now' again conducted by the composer with the BBC Symphony Orchestra. Stanford Robinson conducts a few numbers from 'The Pilgrim's Progress'. Walter Collins conducts 'The Glory of the Sun' and the evocative 'Four Chinese Landscapes', wonderful tone pictures from the Orient. We even have Bantock talking about Sibelius; as well as a few other titbits. The CD is labelled 'Volume 1' and I look forward to further releases from this source. For the time being this is indeed a splendid enterprise. No stars for performance and sound - A unique historical project. The book is only available direct from the author. It is priced £6 00, plus 50p p&p (Europe 75p, ROW £1). If you would like to order a copy please include your details, enclose it with your cheque, payable to 'Vincent Budd', and post to 2 Seallaidh Bharraidh, Polochar, Isle of South Uist, Outer Hebrides, SCOTLAND HS8 5TR Please write clearly. Vincent Budd produces the superbly detailed Bantock Society newsletter. The Winter 1999 one is profusely illustrated with rare photographs and plates centering on performances of Atalanta in Calydon in the USA and on the 1896 Shamus O'Brien tour. Goossens' 1936 first US performance of Atalanta was in a concert which also included Cyril Scott's La Belle Dame Sans Merci with the solo voice role being taken by Theodore Webb.